I love the look of art work and quotes up the walls and as we rent it can be hard to personalise our home. I am so glad that we have a few picture hooks up around our flat as it means we can make our home look more personal to us. We have been living in our current home for three years now and I decided that we needed a bit of a change and so when I was given the opportunity to choose some posters from Desenio I thought it would be the perfect opportunity. Desenio offer a broad selection of trendy posters and wall art for every home and style. You’ll find posters with typography, quotes, black and white photo art and illustrations, to name a few. They also sell frames in the same sizes as their posters to make it easier for you to buy and create the perfect wall. 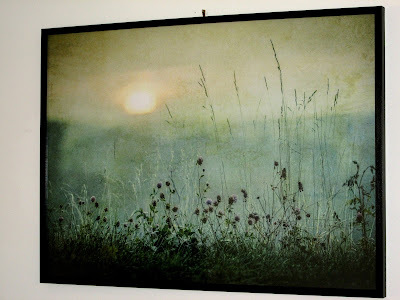 It was extremely hard to choose from their selection as there are so many gorgeous pieces of art work and I wanted to choose ones that we love but also some that are a bit different than we would usually go for. In the end I chose three pieces for our living room and one for mine and Stuart's bedroom. All posters can be purchased in different sizes and the prices are great for those that want to have some amazing art on their wall but are on a budget. 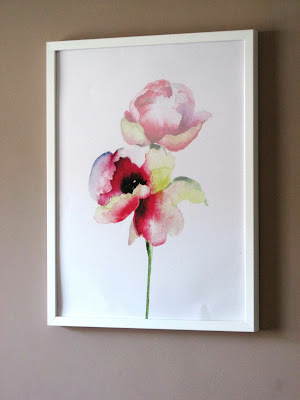 I chose the flower one as I knew it would be perfect on the wall opposite our bed as the colours stand out especially on our beige/brown wall to give a pop of colour and it also happens to go well with my favourite dusky colour bedding. 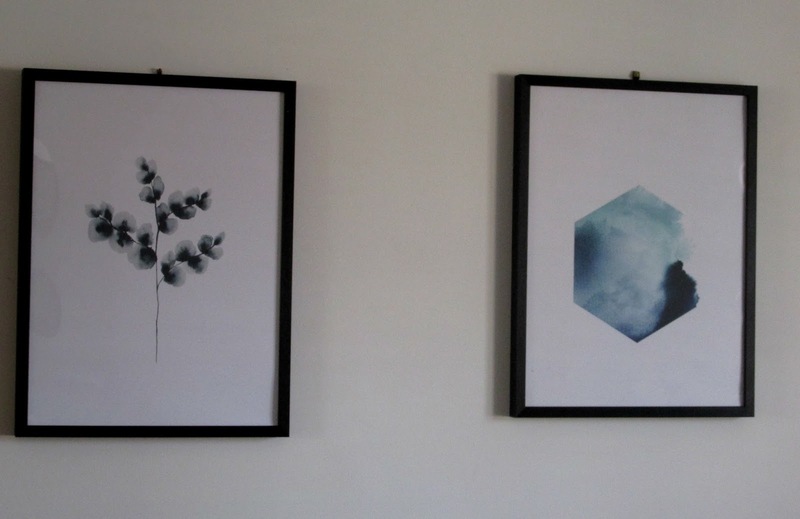 I then chose two prints that I thought would go well together above our sofa. I picked these as I loved the touch of blue and they are a bit different for what I would usually go for however I do love them. The one on the left is of a blue cotton flower which unfortunately the colour doesn't show up that well on my camera. 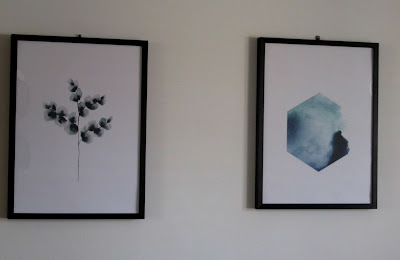 The one on the right is a watercolour blue hexagon pattern which I feel goes really well with the blue cotton flower. Last of all is this stunning Meadow in dawn poster I fell in love with it the moment I saw it online and knew it would go well above our fireplace. I chose to go for the biggest size that they do. It is the most expensive print that I chose however it is more than worth it. The posters are all extremely great quality and on thick heavy weight paper. The frames which I also got with them fit the posters in perfectly keeping the posters in perfect condition. On arrival the posters and frames were packaged well to prevent damage. The frames were wrapped well in bubble wrap and the posters were in a tube making sure they arrived in perfect condition. We love our new art work and frames, they are perfect for updating your home as they affordable as well as excellent quality. We will definitely purchase from them in the future and I've got my eye on some more prints especially ones for Blake's room. If you would like to get your hands on some of their gorgeous prints than you can get 25% off (not valid on "handpicked"/frames) by using code "joannavictoria" between 5th and 7th September. * We were sent the above products for the purpose of this review however all opinions are my own. You've reminded me that there were a few prints from Desenio that I wanted to get for my kids' room! Love your picks. I've been looking up some prints on Desenio recently for my spare room and have been really tempted so now there's a 25% off discount I'll definitely be taking a look next week when I get paid! Glad to hear they're good quality, I really like the floral one you chose! Wow, these are stunning prints! I wish I had space left in my room! Wow, those prints are amazing. That blue hexagon one really draws you in! Very fresh, natural prints. And transporting them without damage is half the battle with companies like this so sounds like they have this covered. Oooh these are lovely and a perfect way to add a little lift to any room. Great that they are affordable too! I love the prints from Desenio - they have some lovely scandi style ones too! That last one is absolutely beautiful! I love decorating our home with artwork, I'd love this for our lounge! Prints can make a house more of a home you totally reminded me that I have been meaning to pick some up! Those are beautiful pieces. Art prints are timeless pieces. Totally love all of the prints you picked as they are absolutely beautiful especially the blue hexagon pattern and blue cotton flower as I've always been fond of the color blue. I love art prints, they can really change the look of a room. All of yours are gorgeous, especially the two blue ones. I need some new prints for my uni room, these look great! Those prints are so gorgeous, I would love to have one of those at home! These are beautiful pictures, we need some more art work so will definitely check the site out. I love Desenio prints. We have our house covered in them.